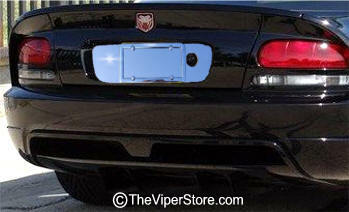 ACC-972027 Dodge Viper SRT-10 (2006-2010) Coupe Stainless Steel and Chrome License Plate Frame Tag Back. 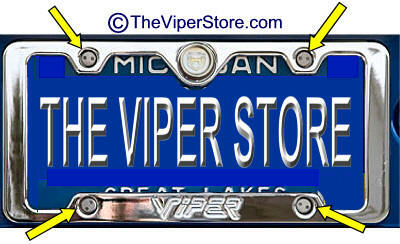 This is the most beautiful highest quality Viper Coupe license plate upgrade set-up in the World! 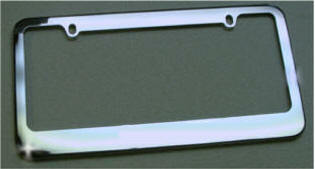 The back plate is stainless steel with a mirror polished finish. 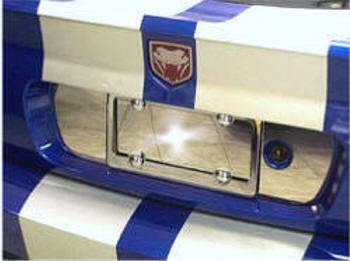 The frame is chromed solid very heavy duty steel . Two chrome caps cover the screw heads for the frame. 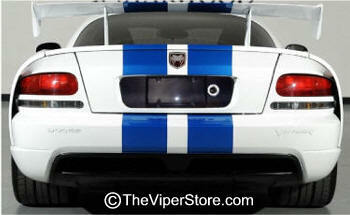 The back plate has soft buffers on the back of them so it won't scratch your cars paint. The entire assembly is held secure with the two bolts. Very easy installation in minutes with a screw driver. Take it off any time with no damage to your car or paint. 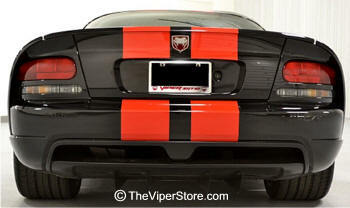 ACC-972048 Dodge Viper SRT-10 (2006-2010) Coupe REAL Carbon Fiber with Black License Plate Frame Tag Back. 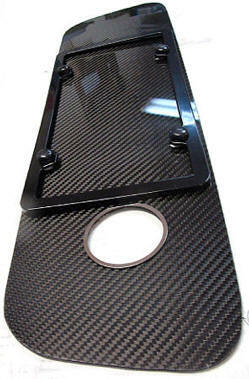 The back plate is real carbon fiber with polished finish. 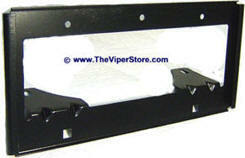 The frame is chromed solid very heavy duty steel . Two chrome caps cover the screw heads for the frame. The entire assembly is held secure with the two bolts. Very easy installation in minutes with a screw driver. Comes with Carbon fiber back plate and a LP Frame. 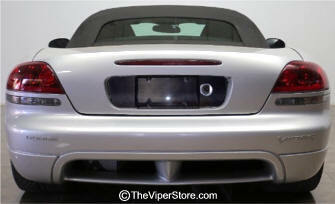 ACC-972029 Dodge Viper SRT-10 Convertible (2003-2010) Stainless Steel and Chrome License Plate Frame Tag Back. 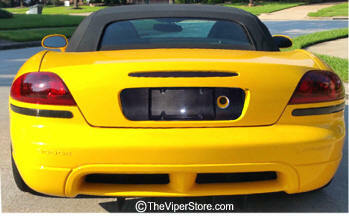 This is the most beautiful highest quality Viper Convertible license plate upgrade set-up in the World! 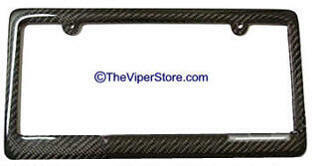 ACC-972049 Dodge Viper SRT-10 Convertible (2003-2010) REAL Carbon Fiber with Black License Plate Frame Tag Back. 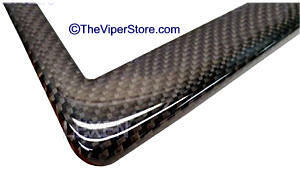 The back plate is real carbon fiber with polished finish. The frame is Black solid very heavy duty steel .Two chrome caps cover the screw heads for the frame. The entire assembly is held secure with the two bolts. Comes with a gloss black license plate frame. (6 1/8" high frame.). Upgrade to pure carbon fiber frame if you choose. 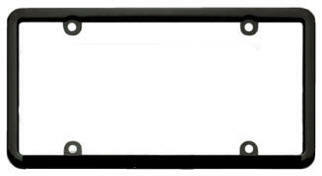 Powder coated Black aluminum License Plate Frame designed to fit the narrow plate well on the Dodge Viper SRT10 years 2003-2010. (6 1/4" high frame.) Classic Lite style. 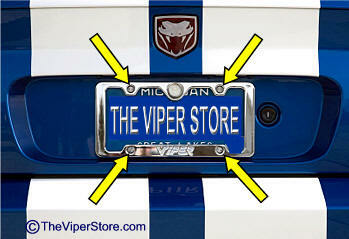 Heavy duty, high quality, black powder coated Stainless steel License Plate Frame designed to fit the narrow plate well on the Dodge Viper SRT10 years 2003-2010. Fits Coupe or Convertible. Will Never Rust. 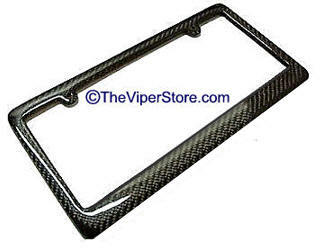 High quality, ALL real carbon fiber highly polished License Plate Frame designed to fit the narrow plate well on the Dodge SRT Viper years 2013-Current. Fits Coupe or Convertible. 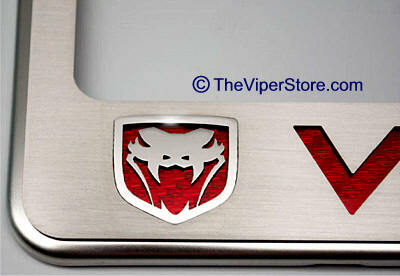 Has Two Fangs Snake head logos with "VIPER SRT10" logo all laser cut out of the top frame. Underneath is carbon fiber color inserts. Includes four chrome resin caps. 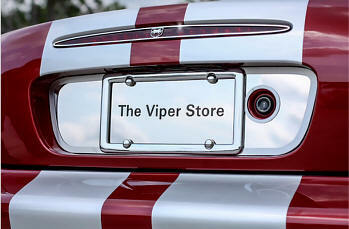 Choose color of "VIPER" logo. 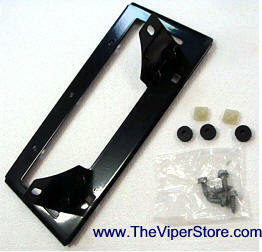 Official MOPAR Dodge Viper SRT10 front steel license plate bracket. 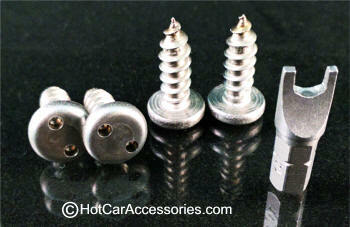 You will need drill to holes in your front fascia to mount.